Here is what I did with the greens from the beets I got at the Green City Market last week. One of the things I love most about getting fresh produce at the market is that everything comes with the greens still attached and I have come to appreciate the subtle differences between them. Swiss chard, kale, and mustard greens are all lovely in their own right, but there is something so satisfying about bringing home a bunch of radishes, beets or turnips and knowing that they will yield me two delicious meals. And they each have their own, specific taste. I used to mainly put them into frittatas or throw them into soup, but lately I have been looking for ways to let them shine a little more than that. So the other night when I needed a quick supper I decided to add to them to pasta. It was a great decision. The earthiness of the greens was a lovely counterpoint to the whole wheat pasta, and the onion, while cooked to sweetness, was still substantial enough to add a satisfying crispness to the dish. The cheese brought everything together. And it was just as delicious at room temperature the next day for a work lunch. And it didn't take much longer to make than it took to cook the orzo. You can use any greens to make this, or any short pasta for that matter although I think the orzo is the perfect size and shape. What I love about using beet greens is that that beautiful deep red color bleeds over into the other ingredients and gives everything a beautiful pink tone. Since much of what I am making these days seems to end up white and boring, having a natural source of food coloring certainly helps. 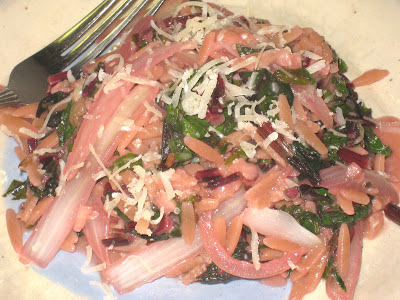 You would get the same effect using red Swiss chard if you can't find a bunch of beets with the fresh greens attached. I only had a small batch of greens, so I only used a half a cup of pasta, which made 2 servings. It would be a simple matter to double everything up to serve 4. Put a medium-size pot full of water over high heat for the orzo. In the meantime, heat the olive oil over medium high heat in a large skillet. Add the fennel seeds and let them cook for a few seconds, until they start to release their oils. Add the onion, the garlic and the stems from the greens. Season to taste with the salt and pepper and cook, stirring frequently, until the onions are just tender. Add the leafy greens and cook for about 2 more minutes, stirring frequently. Add the white wine and stir to deglaze the pan. Turn the heat as low as it will go while the pasta water comes to a boil, if it hasn't already. Cook the pasta for 2 minutes less than the package directions and reserve a cup of the pasta water. Drain and add it to the onions and greens. If it is too dry add pasta water as needed. Cook for another 2 to 3 minutes to finish off the pasta. Remove from the heat and stir in the parmesan cheese. Serve immediately, garnished with more of the cheese.